As a beer enthusiast, you have likely had your fair share of beverages. From light, crisp IPAs to malty lagers, craft breweries across the country are paving the way for new beer trends with a wide range of drinks to choose from for consumers. As your go-to brew pub in Minneapolis, The Herkimer is here to serve as a mecca of flavor and refreshment for beer enthusiasts of all types. Since 1999, our craft beer pub has focused on creating small batch beers that are meant to delight your taste buds. We focus on Reinheitsgebot, which is the German pursuit of purity in brewing. Relying on water, barley, hops, and yeast, our master brewers strive to deliver a crisp, clean taste that is sure to have you coming back for more. As innovators of delicious brews, we always have our sights on the future for growing beer trends and modern expectations. 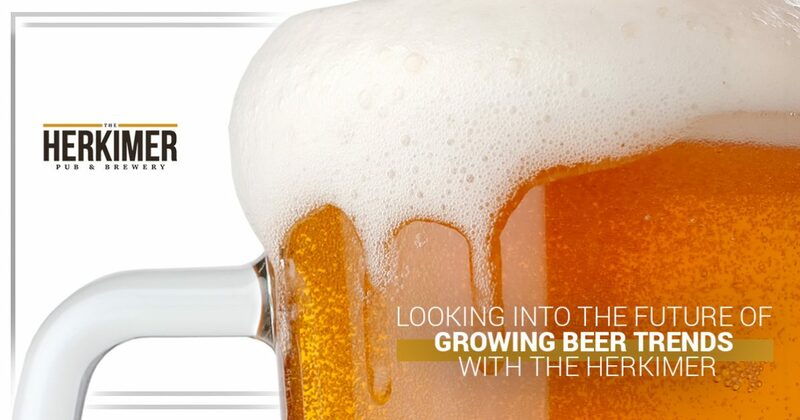 Today, we’ll highlight the future of craft beer, as well as the value that our premium lagers and ales provide. If you’re thirsty after reading this, be sure to stop by our brewery bar in Minneapolis to wet your whistle! Everywhere you go, a craft brewery is open nearby peddling their unique beers. Different establishments brew different styles to match the wants and needs in their community. It’s important to remember that there are over 200 different categories when it comes to beer style, with more than 5,000 craft breweries looking to churn out their own delicious wares. It’s interesting to see a flipping trend in the beer industry, as many larger companies are striving to create unique flavors while independent craft brewers are working to commercialize their drinks with a consistent brand and style. This brew consists of light golden colors with a subtle flavor profile and lighter body when compared to regular pale ales. Starting in the 1980s as a light alternative for the rush of lagers available, golden ales are meant to quench your craving with heavy hops and juicy malts. Many golden ales are characterized by hints of vanilla and citrus fruit. This beer is colorful, is served cold, and will be sure to leave you feeling refreshed! This style of beer comes in a number of varieties based on your origin, with Czech brews being darker and highly carbonated while German pilsners are lighter in body and color. One interesting aspect of crafting a true pilsner is how delicate it can be, requiring skill to make and common sense to keep fresh. Skunked pilsners are the bane of many beer connoisseurs’ existence! Ranging just above 5 percent alcohol by volume, your pilsner will exhibit strong floral aromas and a bitter finish. The Herkimer is happy to create a range of delicious pilsners, delivering new flavors to match the seasons and our customers’ evolving taste buds. If you are looking for a quality brew pub in Minneapolis, The Herkimer is here to help. Our craft beer pub focuses on the best brewing processes to deliver a beverage that is clean, crisp, and refreshing. Check out our menu to find the perfect beer for your face or stop by our sports bar and grill to try all of our wonderful beers out for yourself!